The many castles of Inishowen have always interested me since I came to live in Derry in 1969. Over the years I have tried to find out as much about them from various records. One of the most knowledgeable guides for the area was the late Mabel Colhoun, whose lifetime’s work was the archaeological study of the whole peninsula. She showed me her manuscript many times and shortly before she died I promised her that I would see that it was published. This I did, having the manuscript typed up and saved on to discs and together with redrawing her numbered sites from six inch maps on to one inch maps, handed it over to be published by the North West Archaeological and Historical Society in 1995. Mabel Colhoun had been our first President and Founding Member. I had always worked with old maps and I chose the Wellar and Parson’s map, dated 1661, for the cover, which I had seen in Trinity College Library, Dublin. This map shows many of the castles referred to in this article. This building is a small square keep built of rubble stone and is roofless at present. 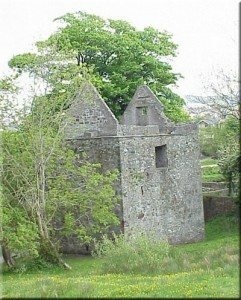 The building lies within the townland of Tullyarvan and is today approached by the Castle Bridge. Experts who have studied the remains of the castle say that it Norman, but is not mentioned until the early seventeeth century. The first record of it is dated 1601 when a Connor McGarrett O’Doherty is living there. There may have been once a bawn or wall around it for protection. When Sir Henry Docwra captures Derry in 1600 he does not even mention the castle. By 1602 Hugh Boy O’Doherty fortifies the keep and by 1608 it is used by Sir Cahir O’Doherty as his rallying point for his soldiers before capturing Culmore fort and Derry. In one of Harry Swan’s books there a photograph of a collection of swords, daggers and pike heads found under the keep. They are supposed to have belonged to Sir Cahir O’Doherty. Very helpful drawings of the two floors of the keep, together with its history, are contained in an article by Oliver Davis and H. P. Swan entitled ‘The Castles of Inishowen,’ Ulster Journal of Archaeology, Series 3, Vol. 2, 1939, pp 183-188. After Finola O’Doherty leaves the castle in 1614 the building and grounds appear to have been taken over by the Vaughan family, who had leased land from Sir Arthur Chichester and occupies it until Henry Vaughan builds the later Buncrana Castle nearby in 1718. Today the castle is under State protection, but could be roofed and made into a permanent exhibition space on the O’Dohertys. This splendidly sited stone castle dated from the sixteenth century. There is a reference to the lands of Grange being granted to Sir John O’Doherty in 1587. The following year of 1588 was the year of the Spanish Armada and many wrecked ships are to be found off the west coast of Ireland. A further reference states that Richard and Henry Hovenden were stationed at Burt to resist any Armada invasion. The castle lies as a ruin on the top of a high round hill and has a good view on all sides. On two corners there are two stair towers rising up three stories and many of the old windows have been taken out and robbed for stone. Outside the tower there was once a wide dry moat, which has been filled in by the local landowner. 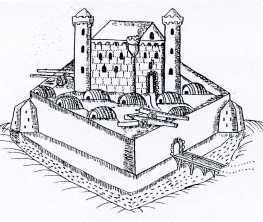 There is a drawing of the castle dated 1601, which shows a water filled moat but, it seems impossible that it ever held any water on the top of the hill. A written description is also given of its site and occupier in the State Papers of 1601. In 1600 Sir Henry Docwra landed at Culmore fort and marched into Derry with his forces. The following year he had taken over the castle from Sir Cahir O’Doherty, son of Sir John O’Doherty, and kept control of it until 1602. By 1607 Sir Cahir attacked it by it held out under twenty men stationed there. Under the Plantation the castle etc passed to a Charles Chichester and by 1833 lay roofless. In 1802 and 1810 Captain Sir William Smith drew very good sketches of the castle from various sides and he describes it as a ‘Spanish Keep’. 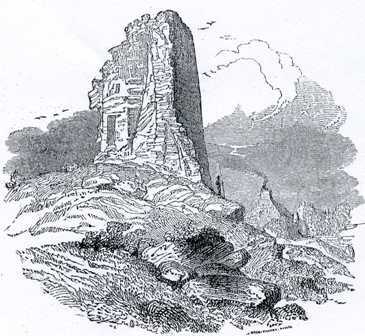 In 1833 an engraving of the old ruined castle appeared in the Dublin Penny Journal and in the late nineteenth century two local poems were written about the castle. The ruins today are very gaunt and very prone to wind and water damage. It would be possible to have the existing walls stabilised to try and preserve what is left. A useful history of the castle was published by Oliver Davies and H. P. Swan entitled ‘The Castles of Inishowen’ in the Ulster Journal of Archaeology, Series 3, Vol. 2, Part 2, 1939. This small tower house lies on the point of Culmore Bay north of Derry City. The fort guarded the entry to the River Foyle from Lough Foyle and seems to date back to 1555. It was then held by the Crown and abandoned in 1567. By 1600 it was held by Phelemy Oge O’Doherty and was captured by Sir Henry Docwra in that year. In 1608 Sir Cahir O’Doherty’s rebelled against Sir George Pawlett, Governor of Derry and he took over the old fort and sacked the City of Derry. The fort at Culmore was held by the Crown until it was sold off with its lands to the Hon. The Irish Society in the late Victorian era. The Society still own the old fort today and it is let to a sailing club. The old castle at Elagh, perched high on a rocky knoll above the Buncrana Road close to Derry, was the seat of the O’Dohertys. It is situated within the townland of Elaghmore. The Annals of the Four Masters record various O’Dohertys in this area and it is assumed that Elagh Castle was their seat. There is a record of a group of Spanish Armada refugees having been captured near Elagh Castle by Richard and Henry Hovenden, who had been based by the Crown at Burt Castle. Their letter, addressed to The Lord Deputy, describes this event and survives in the State Papers and is dated September 1588. They mention that the castle of Elagh was owned by Sir John O’Doherty. When Sir Henry Docwra landed at Culmore in 1600 he sent troops to capture Elagh Castle and to later pulled it down. The lands were later restored to Sir Cahir O’Doherty after the death of his father Sir John O’Doherty. Today the castle lies as a ruin with only a small portion standing. This is a small square keep with a round tower beside it joined on at one corner. The building stands right on the rocky shore of Doagh Island and has been part of a much larger stone built complex of buildings. The castle is at least sixteenth century and was in the possession of Phelemy Brasleigh O’Doherty in 1600. In 1802 Captain Sir William Smith’s three drawings of the castle show some of the outer walls and tower. The Ordnance Survey Memoirs being compiled in the 1830s further measurements and a drawing of the southern side shows walls linking the two towers are recorded. A good account of the castle’s history and detailed sketches of the buildings are published in an article by Oliver Davis and H. P. Swan entitled ‘The Castles of Inishowen’, which was published in the Ulster Journal of Archaeology, Series 3, Vol.2, pp 195-197. A further article on the site of the castle was published by M. Dobbs in the Ulster Journal of Archaeology, Volume 10, Third Series, 1947. Carrickabreaghy Castle is in need of urgent repairs as in a few years time the building will have been destroyed by wind and rain. As 2008 will be a year for looking back at the life of Sir Cahir O’Doherty now is the time to carry out the necessary works. All of the above castles are recorded in the book entitled ‘The Archaeological Survey of County Donegal’ by Brian Lacy and in Mabel Colhoun’s book ‘The Heritage of Inishowen’.